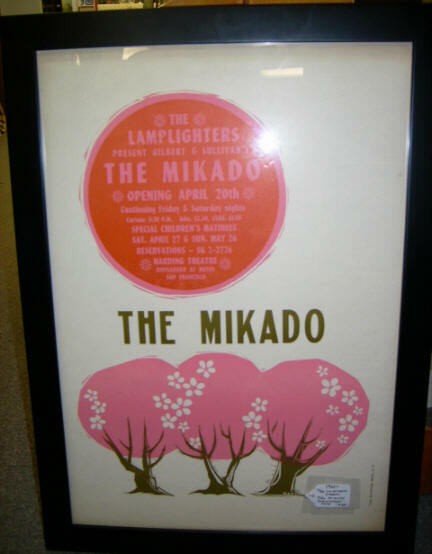 I was in Antique Centre in Scottsdale yesterday and strangely enough, noticed an original framed poster for sale which was advertising none other than the Lamplighters production of “The Mikado” in San Francisco, 1969.
from “The Mikado”(possibly Groucho Marx version) in two of his letters, the first being the July 26, 1970, “little list” letter. It seems to me quite likely that Z may have attended these productions. it’s something I’ve recently seen within the last couple years or so. You know, like you sort of are “into it” for a while until it sort of fades away. In fact, sometimes when I look back on this blog it’s obvious what movies/books I was obsessed with at various times based on the topics I was writing about, as well as the entry titles. It’s worth noting that the Harding Theatre (near Divisadero at Hayes) is in the same neighborhood that Sgt. Richard Radetich was shot and killed (by Waller and Carmelita). Zodiac took credit for this killing in a letter, even though many don’t believe he was telling the truth since details he mentioned regarding the killing had already been in the paper. The murder remains unsolved.